WELCOME TO APPLEWHITE DENTAL ARTS! We offer affordable smile makeovers and provide quality dental care to patients living in Houston, Texas and surrounding areas including Champion Forest, Cypress, Spring, and The Woodlands. Our services include but not limited to General Dentistry, Cosmetic Dentistry, Orthodontics, Dental Implants and much more. We offer the most advanced technology in cosmetic dentistry. Full mouth reconstruction, dental implants, porcelain veneers, porcelain crowns and bridges, braces, and teeth whitening are some examples of how we re-design our patients' smiles. We specialize in beautiful smile makeovers so if you live in Houston, Champion Forest, Cypress, Spring or The Woodlands call us today to schedule an appointment. Easy financing is available. Our number one priority is our patient’s well-being. We implement all the tools available to make sure you have a comfortable experience during your dental visit. If you are looking for the best and affordable cosmetic dentist in Houston, Champion Forest, Spring, Cypress, and The Woodlands, Texas call us today! Dr. Pournik is an expert and one of the best in cosmetic and general dentistry. Her specialties include full mouth reconstruction, dental implants, porcelain veneers, dental crowns, porcelain bridges, braces, teeth whitening and much more! 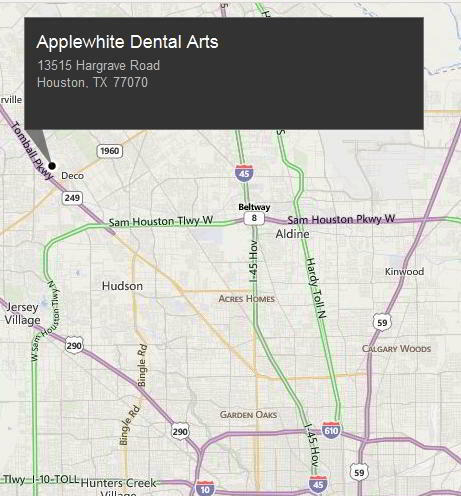 Applewhite Dental Arts welcomes patients from all of over Houston including patients living in Spring, Cypress, and The Woodlands. We offer easy financing and cosmetic consultations. Dr. Pournik can help you regain your confidence and make you look wonderful. Contact us today to see how we can make your smile beautiful. I want to thank you so much for the truly wonderful treatment I received from you and your staff. When I came to you, under emergency conditions after a fall that damaged my front teeth to the point that I lost two of them, you were kind and compassionate. You calmed my fears and reassured me that everything could be fixed. You were so gentle and always concerned with my pain level, which was great considering the condition I was in from the fall. I was very impressed with how you understood how important it was to me that the replacement teeth look natural and that my smile would be right when the process was complete. Dr. Pournik specializes in dental implant dentistry and has many years of extensive training. Dental Implants provide a revolutionary alternative to traditional replacement options, because implants replace the much needed tooth root in addition to its visible structure. This restoration provides a stable foundation that looks, functions, and feels like a natural tooth. Dental Implants also preserve the surrounding bone by providing stimulation to the bone similar to that of a natural root structure. Porcelain veneers can give you a beautiful, bright smile in place of stained, chipped, broken, worn down, undersized, crooked or misaligned teeth. These veneers are wafer-thin shells that are bonded onto the front side of the teeth, and have a completely natural appearance. Dr. Pournik is an expert in porcelain veneers and creates a perfect veneer for each individual tooth to give you that beautiful smile. Looking for an alternative to metal braces? ClearCorrect is the clear and simple choice. No wires. No brackets. Just clear, convenient comfort and every reason to smile. With ClearCorrect, Dr. Pournik can straighten your teeth using a series of clear, custom, removable aligners. Each aligner moves your teeth just a little bit at a time until you eventually get straight teeth. Dr. Pournik is one of Houston’s top dentists and has been practicing dentistry for 14 years. Because the dental field frequently changes, she is always training in the latest techniques and works with the latest advanced dental technology in order to provide her patients with the very best dental care. Applewhite Dental Arts offers a wide range of general dentistry treatments including exams, cleanings, oral cancer screenings and preventative care. Because many people are so nervous or scared of going to the dentist this often can have serious effects on your oral health and keep you from having that beautiful smile you’ve always wanted. Dr. Pournik offers sedation dentistry to relieve you of this anxiety to make your treatment procedure as comfortable and painless as possible. Applewhite Dental Arts has many sedation dentistry options to make the time you spend with us a relaxing and pleasant experience. Since Dr. Pournik works hard at keeping up with the latest techniques and technology she has many treatment options available to restore each of your teeth back to its original function while ensuring they look completely natural. This includes dental implants, dental crowns, dentures, bridges, composite fillings and much more.